Gowerlabs' extensive research experience has resulted in a range of fNIRS headgear options. We work closely with our users to design and develop bespoke headgear solutions that meet the specific demands of their research programmes. Child headgear for NIRS, fNIRS and DOT Imaging on a child in rural Gambia. Image courtesy of the CBCD at Birkbeck, University of London. 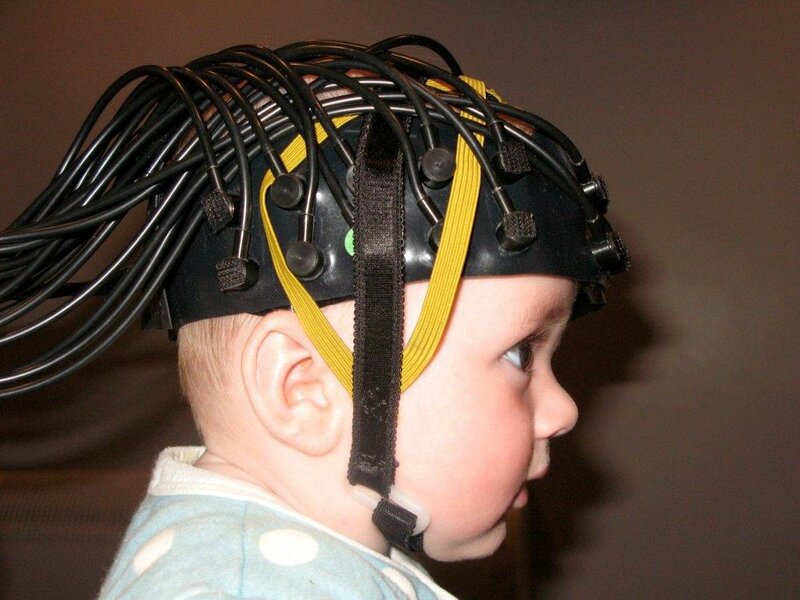 Child headgear for NIRS, fNIRS and DOT Imaging. Image courtesy of the CBCD at Birkbeck, University of London. fNIRS headgear must be comfortable, reliable and adaptable. At Gowerlabs, our headgear solutions come in two principle styles. The first is based on EASYCAP caps (EASYCAP GmbH, Germany): a flexible, anatomically registered head-cap system originally developed for EEG research. EASYCAP caps are available in a wide range of sizes and can be used with all ages, from newborn infants to adults. The caps are comfortable, washable, and easy-to-apply with the Gowerlabs NTS fNIRS system. Because they are designed around the EEG 10-20 coordinate system, these caps also facilitate the direct spatial registration of fNIRS measurements with the cortical anatomy. More information about EASYCAP caps can be found here. The second format is available via our partners at the Centre for Brain and Cognitive Development (CBCD, also known as Babylab) at Birkbeck, University of London. Babylab designs and manufactures fNIRS headgear for infants and toddlers based on their extensive experience applying Gowerlabs' fNIRS technology to study cognitive development. More information about the CBCD fNIRS headgear can be found here. In recent years, research has shown that short-separation fNIRS channels can be used to significantly improve the accuracy and reliability of fNIRS measurements. The flexibility of the Gowerlabs NTS fNIRS system allows users to incorporate multiple short-separations measurements in to their array design, resulting in higher-quality fNIRS data and more accurate interpretation. The NTS employs high-quality, lightweight and flexible glass fibre bundles that provide excellent optical coupling and transmission. Our fibres are constructed from thin-cladded optical fibre to provide a maximum packing fraction, and thus increase light collection. Each infant optical fibre bundle has a flat, wipeable surface that is designed to minimise the pressure applied to the infant scalp during fNIRS recording. These fibres are also designed to work with our infant foam couplers, which provide a padded, opaque coupling surface that helps to ensure the subject remains comfortable during each fNIRS study. Gowerlabs infant optical fibre bundles can be coupled directly into our EasyCap and CBCD infant headgear systems. Gowerlabs adult fibres bundles include extra features to improve fNIRS signal quality in the presence of thicker hair. Each bundle is coupled into a specialized adapter that fixes into the EasyCap in conjunction with a foam coupler that ensures fibre stability and subject comfort. Gowerlabs’ adult fibre bundles can be easily removed from these adaptors during experimental setup to allow hair to be combed out from under the fibre location. Our adult fibre bundles also have an extended fibre tip that can comb through the hair and thus maximise fNIRS signal quality. Our adult+ fibre bundles incorporate an extended fibre tip at the subject interface, and are designed to work with Gowerlabs’ spring-loaded fibre adapters. These adapters maintain a slight downwards pressure at the point of contact with the scalp, while allowing the fibre tip to protrude by up to 6 mm. The strength of the spring used in the Gowerlabs spring-loaded fibre adapters was carefully selected to provide a balance between data quality and patient comfort. Experiments have demonstrated that the adult+ system can provide a greater than 10x improvement in fNIRS signal-to-noise ratio in subjects with thick, dark hair, while still remaining comfortable for studies greater than one hour in duration. For further information or for a quote, please contact us.